The photo of a couple smiling just after filing for divorce has gone viral this week, setting a positive example for exes and co-parents everywhere. 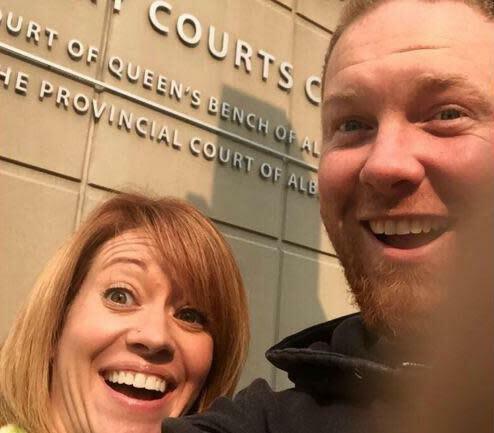 The selfie, which Sharon Neuman posted to Facebook on Thursday, shows her posing in front of Calgary Courts Centre with her ex-husband, Chris Neuman. The reason for the happy faces? “Are we smiling because the partner we chose for forever turned out not to be the forever partner we needed? Of course not,” Sharon explains. “We’re smiling because we have done something extraordinary (we think anyway!). We have respectfully, thoughtfully, and honourably ended our marriage in a way that will allow us to go forward as parenting partners for our children, the perfect reason that this always WAS meant to be, so they will never have to choose.” Sharon’s post received more than 27,000 shares (however, it’s no longer on Facebook), according to Global News. Sharon closed her post with two hashtags: #teamneuman and #divorceselfie. She did not respond to Yahoo Parenting’s request for comment. In an interview with Global News, Sharon explained that the road to this moment hasn’t been easy. “We’ve been separated for nearly four years, and our journey has been long and often painful, but I do feel very confident that we can maintain the positive relationship we have now, because it matters so much to us to do so,” she said.